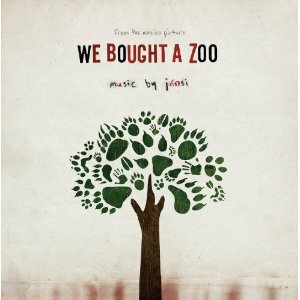 The We Bought a Zoo soundtrack comes from Sigur Ros main man Jon Thor Birgisson AKA Jonsi. Written and recorded in short order, over four months this summer/fall at the famous Village Studios in Los Angeles and at the singer's home studio in his native Iceland, the soundtrack to We Bought A Zoo comprises more than half-an-hour of brand new music from Jonsi, including two full songs and nine achingly beautiful themes, plus songs from Jonsi's acclaimed solo album, Go, as well as what might well be regarded as Sigur Ros' most memorable tune, in 'Hoppipolla'. Orchestral arrangements on the score have been handled by previous Jonsi working partner, and 'Reader' soundtrack composer, Nico Muhly, who brings his quixotic genius to the string and brass sections. Check out the newest song from Jonsi below, titled 'Gathering Stories' which is featured on the Soundtrack. Also head over to Amazon to Pre-order the album which will be released on December 13th.